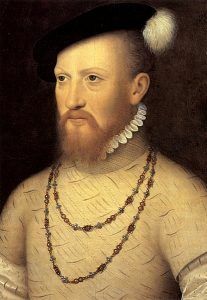 Citation: C N Trueman "The Fall of Seymour"
Edward Seymour, Earl of Somerset appeared to have everything handed to him to become England’s most powerful nobleman during the reign of Edward VI. While a cohort of men had been chosen by the ailing Henry VIII to act as guardians to the boy king, I quickly became clear that on the accession of Edward, Somerset was the leader of this Privy Council. Somerset probably could not have had a better introduction to power. He was one of the men personally chosen by Henry VIII to look after his son in the years of his reign when Edward was legally a minor. This appointment in itself gave Somerset great power. He was also the guardian of a minor – which must have given him the opportunity to fully assert his authority and build a power base in court that few could have matched. Yet by October 1549, Somerset was under arrest and in January 1552 he was executed. What led to his fall from power? Few would doubt that Somerset’s personality was a major reason in explaining his fall. Somerset believed that he was apart from others in the Privy Council even in the earliest of days of Edward’s reign. He was aloof but he was also arrogant. It was this arrogance that angered many at court and as Somerset’s power increased from 1547 on so did his arrogance. He became a man who believed he could do no wrong and the very men with who he should have courted positive relations, were the men who tuned on him. Somerset committed a very foolish act by failing to act with the Privy Council and using his own household to conduct business. By alienating the senior aristocracy, Somerset isolated himself. Another reason for his fall from grace was the simple fact – he was inept. He lost the support of the senior aristocracy as a result of his stance with the Privy Council. But he also lost the support of the gentry as a result of his poor handling of the peasant uprisings, which threatened their very livelihood in the regions. Many gentry were also wary of his religious reforms. The regions tended to be more conservative than London and many there were wary at best of Somerset’s religious reforms or simply hostile. It was clear that if a rival came to the fore, then the position of Somerset would be challenged. That rival was John Dudley, then the Earl of Warwick and the future Duke of Northumberland. It was Dudley who had shown decisive leadership in defeating the Norfolk rebels in August 1549. The following month Dudley arrived in London with a successful military campaign to his record and found that he had the support of many of the capital’s senior nobility. He also had the grateful thanks of the gentry in East Anglia after his success against the rebels there. This was all in stark contrast to the incompetence displayed by Somerset. At the very moment when he needed to show decisive leadership, Somerset fell way short. The speed with which he lost support can be shown when in October he issued a proclamation ordering all loyal troops in England to prepare to defend the land – presumably against Dudley. It was ignored and Somerset moved the Royal Household from Hampton Court to Windsor Castle for its own safety. The Privy Council responded by blaming Somerset for the peasant uprisings. However, the one thing that Somerset was desperate to avoid was civil war – probably because he knew he had no way of successfully campaigning against Dudley and his supporters. On October 8th 1549, Somerset agreed to negotiate a settlement and was arrested on October 11th. Dudley represented all the qualities that Somerset did not. He was decisive and at this period in time did not take the support of the nobility for granted. Somerset’s over-inflated opinion as to his own abilities were in stark contrast to Dudley and consequently led to his swift fall from power. In 1547, on the accession of Edward VI, on paper Somerset had it all. However, by the end of 1549, he had fallen from power. Between 1549 and 1552, Somerset had little power and his attempts at intrigue led to his execution.